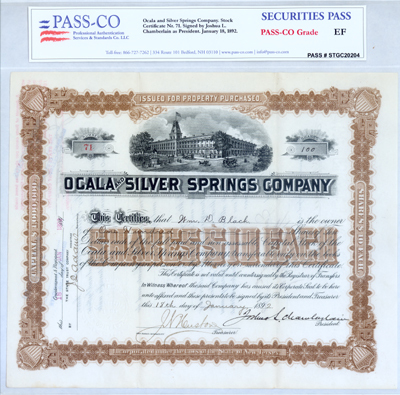 PASS-CO has developed the most comprehensive system for the grading, authentication and scoring of collectible stock certificates and bonds. Our grading standards are compatible with those generally accepted throughout the industry. PASS-CO's standards have been reviewed by a number of the industry's leading dealers and collectors who have thoughtfully contributed ideas and suggestions in order to encompass the broad concerns faced by collectors of stocks and bonds. Your PASS-CO Securities PASS includes grading and authentication of your certificates by a team of PASS-CO's experts. For an additional fee you can have your item SCOREd, which provides the added value of placing your item within a range of similar items of the same type.